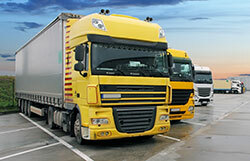 Businesses often think that a fire won’t happen to them. A Lincolnshire based garage, however, had taken prudent precautions and had asked Safelincs to install powder fire extinguishers in its workshop. These suddenly became very important when a vehicle that was being worked on suddenly started to smoke and the engine caught fire. 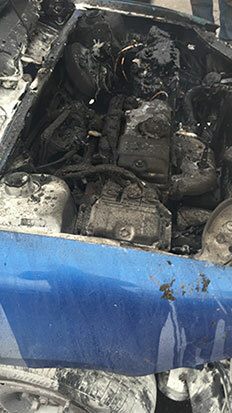 The fast thinking of the mechanics ensured that the fire was quickly and efficiently extinguished, preventing excessive damage to the vehicle and also to their premises. To ensure the garage was seamlessly protected Safelincs instantly replaced the extinguishers used to fight the engine fire free of charge. Safelincs replaces any fire safety equipment damaged or used in a fire for free as part of its commitment to protect its customers. 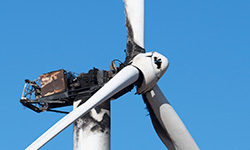 A rapid recovery after a fire is essential for customers and having new fire fighting equipment in place straight after the fire is part of a larger picture. Using fire extinguishers which cause a minimum of clean-up after the fire is extinguished also helps to recover quickly from a fire. Safelincs can advise customers on the best extinguisher options in each industry, drawing from a huge range of extinguishers and years of experience. We offer traditional fire fighting extinguishers as well as clean ranges that hardly leave any residue, for example dry water mist extinguishers, suitable for a large area of applications. Businesses should ensure that they have completed a risk assessment to identify the fire risks associated with their business and install the appropriate fire detection and fire fire fighting equipment based on these findings. 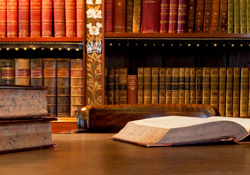 Carrying out a fire risk assessment is a legal requirement for businesses. For more information about our services call 0800 612 6537 or email support@safelincs.co.uk. With homes and flats across London, Hertfordshire and Berkshire, leading Jewish charity Norwood gives adults with learning disabilities the support they need to choose where they live. In each property, housing support is available according to each person’s needs; they can choose between sharing a house with 3-6 people, sharing a flat or living on their own. Norwood has to ensure that all its properties have adequate measures in place for safeguarding in the case of fire. This includes the provision of fire extinguishers which have to be serviced annually – at considerable cost. Norwood became aware of the service-free P50 extinguishers which are constructed using a composite material that will not rust or corrode. They do not need servicing, as a simple annual check, which can be carried out by a member of Norwood’s own staff, is all that is required. There is also no refill required after 5 years – P50s only need refilling after 10 years. Safelincs have so far provided around 100 of the P50 extinguishers (mostly foam) to Norwood and is rolling out a replacement program across most of the properties. 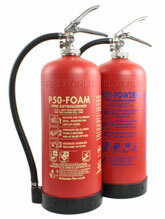 Unlike most foam extinguishers, P50s contains a type of foam that is also safe to use on most electrical fires. Therefore they can be used on multiple fire types; the risk of Norwood staff or residents, although trained, using the wrong type of extinguisher, has been eliminated. Although P50s are slightly more expensive than conventional extinguishers, Norwood benefits from massive savings by not having to call in service engineers each year. After ten years the units can be refurbished and used in exactly the same way for a further ten years. Empire Cinemas is one of the latest Safelincs customers to benefit from the minimal maintenance costs of P50 fire extinguishers. The largest independently-owned cinema chain in the UK, Empire Cinemas has just opened two new cinema complexes at Hemel Hempstead and Catterick Garrison, and was determined that its new cinemas should have the most modern appliances fitted. Safelincs supplied and installed P50 foam and P50 wet chemical extinguishers in the new cinema complexes as well as the linked restaurants and cafes. The appliances were selected primarily for their low maintenance costs. Unlike conventional extinguishers, P50s do not require an annual service by an external engineer; a simple check can be undertaken each year by one of the cinema’s staff, which is where the savings are made. The kitemarked P50 extinguishers are guaranteed for ten years after which they can be refilled and used for another ten years. When the fire extinguishers in the all the other cinemas come up for renewal, it is intended to replace them with P50s. Bowmer & Kirkland, a very successful UK construction, engineering and development group, is investing in P50 foam extinguishers for the majority of its construction sites. With more than 100 active sites working across all sectors throughout England, Wales and Scotland, on-site safety is paramount for the Bowmer & Kirkland Group. Every installation has to be equipped with appropriate fire extinguishers. Previously this had meant a mixture of water or AFFF, dry powder or CO2 extinguishers. Investing in P50 foam extinguishers enables the company to simplify the types of appliances employed whilst still covering all eventualities. 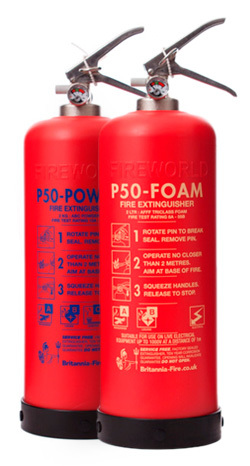 P50 foam extinguishers can be utilised on Class A and Class B fires, and are safe for use on live electrical equipment up to 1000 volts at a distance of one metre. This means that on many sites a single type of extinguisher can be employed instead of three. P50s are constructed from a very strong composite material and are not susceptible to dents, rust or corrosion like standard extinguishers. Models with anti-freeze additives remain operational down to temperatures of -10 °C. As well as reducing the overall number of extinguishers required, Bowmer & Kirkland now has portable fire fighting equipment that is especially suited to the extreme conditions on some of its sites. It’s nearly ten years since Safelincs first started working with Villa Plus, a company providing over 1,250 holiday villas across 14 European destinations. Safelincs is depended upon to ensure that all Villa Plus’ accommodations are equipped with the necessary safety equipment. Fire extinguishers, smoke alarms, carbon monoxide alarms and domestic first aid kits are sent by Safelincs to a shipping company in the UK for distribution to Villa Plus properties around Europe. The goods are packaged separately in line with each region’s requirement and labelled accordingly. “Safelincs extensive range of safety products and their ability to meet our specific shipping requirements to different regions makes them an ideal partner to work with. As we grow and launch villas in new and existing destinations Safelincs will be a valuable provider,” says Nick Cooper, Villa Plus director and founder. 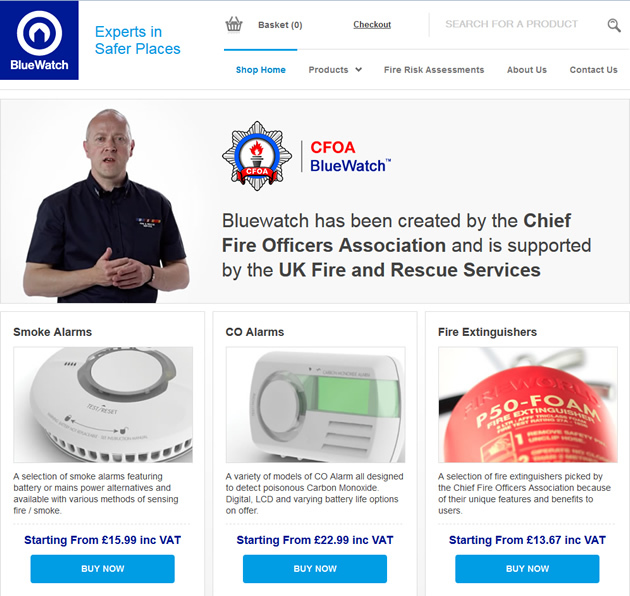 CFOA, the Chief Fire Officers Association, through their subsidiary Blue Watch and in partnership with Safelincs, have launched a fire safety shop offering information and fire safety products for landlords, tenants and home owners. The site is a one-stop shop to allow residential users to select the products most suitable for their application, safe in the knowledge that the products have been carefully selected and are suitable for them. Each category of buyer has its own selection of smoke alarms, carbon monoxide alarms and fire extinguishers to choose from. The website will help increase fire safety awareness and raises funds for CFOA to allow it to promote its fire safety messages in an environment of government cutbacks. The site will sell a selection of smoke alarms, fire extinguishers and carbon monoxide alarms with Safelincs managing and fulfilling all orders on behalf of the CFOA.